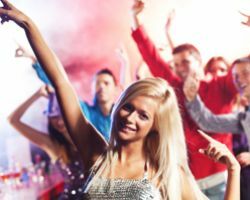 Many couples turn to the services of Sound Precision Entertainment to meet all of their Cleveland DJ needs because of the wide variety of services that they offer. This company plays the very best music to suit your event, which you will hear booming through their 15 speakers. In addition, they will also provide 2-palette lighting to add to the fun atmosphere on the dance floor. Whether you would like to customize the music or would like to add more lighting, these professionals can accommodate. The entertainment at your event is what is going to create an atmosphere most effectively and is why many couples hire Me, Him & Her as the entertainment and DJ at their wedding. Reviews of this company make it clear that the team of professionals is the most caring and reliable vendors the couples have worked with. 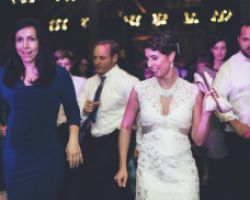 With over 20 years of experience finding the right music for their clients, you can be sure that this company will play your favorites and tunes that everyone will dance to. 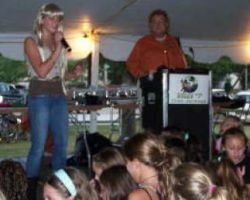 Freddie James DJs is one of the premier entertainment companies in all of Ohio because of the personalized services they offer their customers and their reliability. 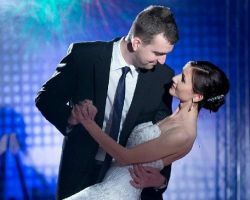 This company wants to make your weddings as special and memorable as possible and they can do that by creating a fun atmosphere with music and lighting, as well as acting as the MC to ensure the flow of the event goes smoothly. With over 35 years of experience, you can trust that these DJs know what they are doing. If you want a Cleveland disc jockey with years of experience as not only a DJ but an entertainer, then look no further than Billy J Full Spectrum Entertainment and DJs. This company has been providing the highest quality entertainment for over 20 years at parties, proms, and more formal occasions like weddings. The experts at this company know that you are putting your faith and trust in them to make your event as fun and authentic as possible, a responsibility they do not take lightly. If you want your wedding to be elegant and fun throughout the entire night, then you should definitely hire the services of Burning River Entertainment Group. This company wants your wedding celebration to be fun and memorable while still maintaining the class of the event. 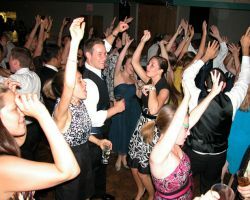 These professional DJs in Cleveland, OH will play great music that gets everyone on their feet but will also help you to make the event flow as smoothly as possible as the MC for the entire reception. 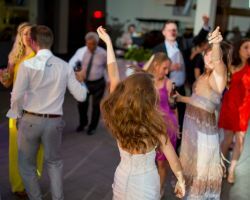 American Entertainment offers to play great music to get everyone dancing, MC the entire event and coordinate with vendors as well as provide sound system rentals all to ensure that your wedding celebration is one to be remembered. This company also provides up-lighting to create a softer and more intimate atmosphere for dinner and a party atmosphere later in the night as well as the possibility to have video projectors and a screen. Choosing this vendor means having the very best equipment and services for one affordable price. The DJs at Magical Sound Entertainment each have a style all their own with the same level of customer service and talent. Each DJ at this company works with clients to give them the very best experience possible. 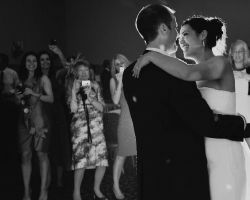 Knowing this, couples can choose which DJ style suits their event the best, knowing they will be in capable hands no matter which one they choose for their wedding. With the latest equipment and unbeatable talent, this company offers all you need for entertainment on your big day. Entertaining groups of any size is the passion of Just Dreaming Entertainment. This company offers professionalism and reliability so their clients can trust them to create a fun and exciting atmosphere at their event. With experience at events like weddings, private parties, birthday parties, etc. you can be sure that these experts can handle any style event with ease. Reserving a local DJ does not have to come at a high cost when you consider the talent of this company and the low prices they offer for their services.